The FT is running this week a series of articles (here but behind a firewall) on European manufacturing and how it is surviving the crisis. In an article on French industry, it suggests that focusing on the grim facts of deindustrialisation and declining competiveness in the North-East of the country risks missing much of what makes French industry successful. It argues that in some sectors France is following the German recipe of success: focus on cutting edge industries, invest heavily in research and development, and make the best use of a highly skilled (though albeit expensive) labour force in order to produce high-quality manufacturing products. The example it gives is of passenger jet engine-maker, Safran, and its more specialised companies like Turbomeca that make helicopter engines. The article has some arresting facts and figures. Turbomeca is recruiting 200 new engineers this year, a reflection of its status as the world’s largest helicopter engine maker by volume. Safran, its parent company, is recruiting up to 7,000 new engineers, half of which will be employed in France. Its strategy has been to focus on R&D: 12% of its sales revenue was reinvested last year into research. On the Hollande government’s 20 billion Euros tax credit aimed at boosting competitiveness, the article cites the Peugot-Citroen CEO as saying that it will only bring down the company’s 4 billion Euros labour cost bill by 2.5%. The article itself suggests high labour costs can be offset by investment strategies that focus on innovation and research. But the figures it gives all go to show that what matters is the ability to bring down the wages bill: either via internal adjustment or through outsourcing. Internal adjustment is what Southern European countries have been experiencing, with a positive impact on some export sectors. In France, Safran’s success comes from outsourcing 70% of its engine components. Much of the lower end manufacturing is done in countries with lower wages, a move that also matches German businesses. Another arresting fact: according to McKinsey, in 2009 the average hourly cost of a French factory worker was 32 Euros and in Germany it was 29 Euros. But taking into account the contribution of component suppliers from Eastern Europe, where wages are lower, the real cost of German labour was 25 Euros an hour. In discussions of Germany’s current competitiveness, much is made of Schroder’s labour market reforms and the discipline shown by the country’s labour force. Less attention is given to the role played by this out-sourcing strategy. The FT article concludes with the suggestion that North Africa should become France’s low wage periphery in the way that Eastern Europe has become Germany’s, something Renault has already done by relocating some of its car production to Morocco. There has been much debate about how France can regain some of its competitiveness. Some suggest a strategic reorientation away from traditional manufacturing towards more hi-tech activities. What seems obvious is that lowering wages is still the strategy overwhelmingly favoured by businesses. Given how unlikely it is that this occurs via internal adjustment in France, the most probable outcome is that French companies continue to exploit outsourcing opportunities. As long-time observer of French politics Art Goldhammer has pointed out, there is little in the French government’s battle with the Indian steel magnate, Lakshmi Mittal, that makes sense. Uncertainty prevails over what deal the government has done with Mittal, what promises he may or may not have given, and what the future is for the Florange plant that is at the centre of the whole affair. One thing that seems to be clear: there will be no forced nationalization of the plant, as argued for by France’s industry minister, Arnaud Montebourg. Well-known as a voice on the left of an otherwise rather centrist Socialist government, Montebourg has long championed the cause of “de-globalization”: a return to national protection and a more traditional national industrial policy of old. Montebourg plunged into the Mittal affair by criticizing publicly the Indian businessman, accusing him of not keeping his promises. His proposed solution – that gave much hope to the workers of the steel plant threatened with closure – was to force a nationalization of the plant. Mittal resisted, saying he was willing to let the government take over some of the plant but he wanted to retain those elements he thought could be profitable. At issue are two blast furnaces at Florange which Mittal argues are no longer worth keeping given the overcapacity of steel production in Europe. As demand for steel has fallen, so Mittal has been forced to rationalize production. Existing demand can be met by steel production in other sites, such as Dunkirk (read economist Elie Cohen on this here), leaving the Florange furnances without customers. As the government wasn’t ready to cough up the cash needed for a full nationalization, and many in the government were opposed to doing so, it made a deal with Mittal. Though Mittal committed himself to 180 million Euros of investment in cold steel processing at Florange, the issue of the blast furnaces remains unsolved. The government is claiming that it has saved the 629 jobs that were threatened but the unions don’t think Mittal will keep his word. What is really at stake in this affair? In many ways, it seems distinctly French and confirms much of what The Economist wrote about France a few weeks ago in its special report on the country. Loud union reps camping out at the entrance to the site, vitriolic anti-capitalist rhetoric from leftwing ministers, behind-the-scene deals brokered between political and business interests: all evidence of the poor state of corporate France. Beyond some of these clichés, two issues stand out. One is to do with Montebourg. His appointment as minister responsible for revitalizing French industry was surprising. As someone who harbours ambitions far grander than saving a few hundred jobs on the Franco-Luxembourg border, Montebourg could have been expected to resist the poisoned portfolio. It was obviously going to mean fighting a losing battle over unproductive sites like Florange and yet he accepted the job. What has been tested in the Florange affair is Montebourg’s representativeness. Does he stand for a strong current in French opinion and within the Socialist Party about a state-led route for industrial rejuvenation? Is it correct to see France as torn between its Colbertian instincts of old and a new recognition of the need for liberalisation and market-driven competitiveness? This is the kind of ideological battle The Economist likes but events over the last few days suggest something rather less dramatic is going on in France. Montebourg doesn’t seem to have his own industrial strategy but nor does the government. At the very least, strategies are about choices and priorities. What the government’s response over Florange has demonstrated is immobility and fright: unwilling to give up on the Florange workers and yet unable to place their intervention in this case within a wider plan for French industry. Montebourg appears as the fire-fighter in chief more than as a voice for an alternative French industrial strategy. The second issue is about nationalization itself. Elie Cohen argues that the Florange affair is different from other recent instances of nationalization: General Motors in the US, Alstom in France. He is right to point to differences: there is little in common between Florange and the company-wide restructuring that resulted from the government takeover of General Motors. But he doesn’t mention the other obvious case of nationalization, that of banking and financial institutions. Via bail-outs, some of these have become the property of tax-payers. In all cases, this was evidence of massive strategic intervention by public actors to save a financial system they believed was on the rocks. Why is it that such interventions are free from the sense of helplessness and pointlessness that government involvement in failing manufacturing industries evokes for all observers? Former Danish Prime Minister, Poul Rasmussen, an articulate European social democrat, once made the observation that many Western politicians appear unwilling to accept a shrinking of their country’s financial sector but they are willing to run down almost entirely their manufacturing sectors. He put this down to a deference elected representatives felt in the face of suave and sophisticated bankers. He perhaps exaggerated the point but it is certainly true that whilst government intervention to save failing industries appears to us anachronistic, intervention to prop up a tottering financial sector is seen as far-sighted and brave. This is surely as much about sentiment as it is an objective assessment. After all, a reason why the government couldn’t afford to nationalize Florange is that it still hasn’t paid off the debts incurred in saving its banks. These are the kinds of priorities the French government cannot articulate but they are nevertheless there in the background and structure government action over the mid to long term. There is no strategy there, but an underlying structure of interests and relations of power upon which French society rests. There are some classical components to the problems faced by one of France’s best-known car-makers, Peugeot-Citroën. An economic downturn has hit Peugeot-Citroën’s sales. Its dependence on car-buying in the Southern European markets of Spain, Italy and Greece was higher than some of its rivals and so it has been harder hit by the Eurozone crisis. It hasn’t so successfully relocated production to cheaper parts of Europe, as Germany’s Volkswagen has done for instance, meaning that labour costs remain high. The decision to close its large plant North-East of Paris, at Aulnay-Sous-Bois, was an obvious case of shifting manufacturing activity out of France to places where wages are lower. Overall, margins are tight in an incredibly competitive industry and the downturn has pushed the less competitive players to the edge. Looking more closely, though, the picture is more complex. This week, the French government intervened in the company’s crisis. Having long spoken about the need to limit the famous “plan sociaux” of big French firms, the government’s intervention was not directly aimed at limiting the number of jobs to be lost through the closure of the Aulnay plant. In fact, the government seems largely to have accepted that Aulnay will close. Instead, the intervention took the form of a bail-out of Peugeot-Citroën’s financial arm, Banque PSA Finance (BPF). Faced with the threat of a credit downgrade of 5.6bn Euros of its debt, owing to the declining fortunes of the car firm, the bail-out is reported to involve a guarantee of around 4bn Euros of debt and the supply of new credit lines of up to 1.5bn Euros. It is no coincidence that the government intervention is in the form of a bail-out to the financial arm of Peugeot-Citroën. In recent years, the car-maker has made money not just out of making and selling cars but also out of financial activities associated to its car business. Involving itself in the provision of credit to potential car-buyers has been one way the company has managed to stay in the black. In the third semester of 2011, the total revenue of the company rose by 3.5%. However, this growth did not come from car sales as such. It came mainly from the company’s component manufacturing arm (Faurecia), its manufacturing logistics arm (Gefco) and from its bank, BPF. As with other automobile companies, Peugeot- Citroën has had to rely on revenue streams other than just those of car manufacture. As the company began to rely on financial activities, it became increasingly vulnerable to any rise in its borrowing costs. This is what is happening today, hence the government bail-out. Paradoxically, the very success of Gefco means that may be sold by Peugeot-Citroën in an asset fire-sale intended to raise much needed cash (for details on the Gefco sale, see here). 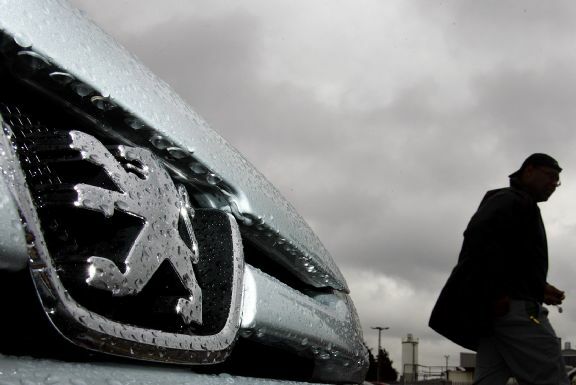 The events at Peugeot-Citroën appear as a classic case of government intervention in an ailing manufacturing sector. In fact, the government is bailing out a bank owned by the car company, set up as a way of profiting from credit provision. This suggests that it is easier for a government to channel funds in ways that keep a financial subsidiary afloat than it is to prevent mass redundancies and factory closures. It also tells us of the extent to which car-makers today rely on more than just selling cars to balance their books. We have often argued at The Current Moment that what is missing in both the US and Europe is a real plan about how to make these economies grow. The political right points to the need for tax cuts; the left prefers state-funded jobs programmes. Neither addresses the problem of a languishing private sector, where firms are sitting on cash rather than reinvesting it. Central banks have tried to stimulate the economy by pushing down interest rates as way of stimulating private borrowing. As argued before (here), quantitative easing has not had the desired effect. One response to the current problems is to point to the need to get consumers spending again. Firms are sitting on cash because they are gloomy about the future: without more buoyant demand, more investment will only mean the production of unsold goods. Critics of the austerity measures being pushed through across Europe often frame their opposition in terms of its effect on demand: how can European economies grow if the continent’s consumers are being hit with new taxes, cuts in welfare incomes and job losses? This consumption-oriented view of growth is worth comparing with the growth experiences of the emerging markets. Growth does not just come from consumption. In fact, things look rather different if you look outside of the US and Western Europe. Take China. 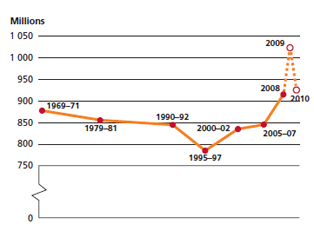 In its recent World Economy report, The Economist notes that the percentage of the gross national product that is consumed has fallen steadily in China since the 1970s. If we were to map China’s annual growth figures on the graph, the relationship between consumption and growth would be an inverse one: a rise in the latter as the former has fallen. This makes sense if we look at how Chinese investment decisions are made. Capital is channelled via state-controlled banks into production. The percentage of the GDP that is reinvested is remarkably high in China: around 50% of GDP. It is on average half of that in OECD countries. One way of looking at the contemporary slump in Western Europe and the US is through the lens of productive investment rather than that of consumption. The Chinese model has its own limitations, not least its reliance upon the demand for its exports in overseas markets. China is also at a different stage of its development, meaning that we are not comparing like with like. But it is nevertheless useful as a way of generating different sorts of questions. In what ways are investment decisions made? By whom and with what goals exactly? And crucially, how has the role of financial intermediaries changed over time and what impact have those changes had on investment? We don’t have answers to these questions yet but they are a good place to start when thinking about the growth problems in contemporary Europe and in the US. Asking workers to sacrifice benefits, on top of stagnating wages, is just piling on. And it misses the point that most workers have been “burden and sacrifice sharing” for more than thirty years. Obama’s typically tone deaf appeal used almost exactly the same language as managers and CEOs used during the labor battles of the 70s and 80s. The promise then, of course, was that, if workers worked harder, increased their productivity, and sucked it up then, then they would reap gains sometime in the future. We have more than enough to feed the global population, yet about one in six does not get enough to eat. 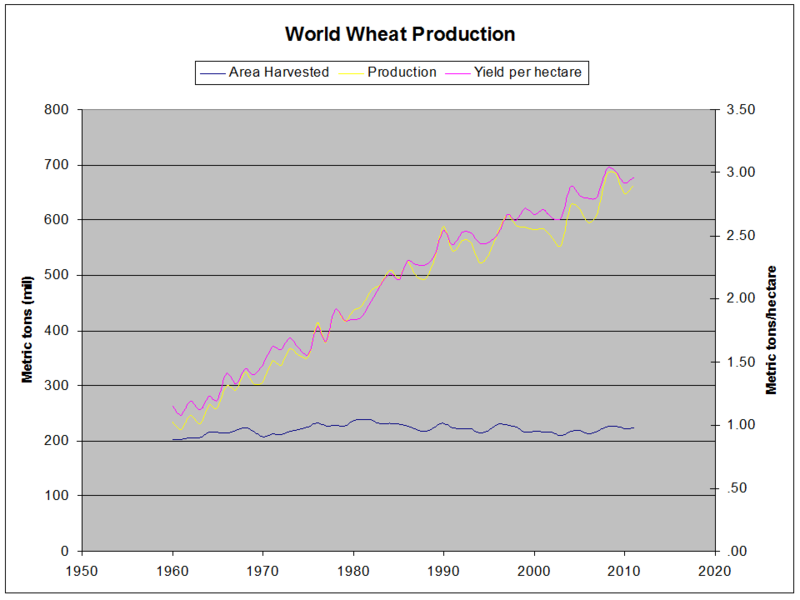 Wheat production is a very crude measure of the ability to meet global food needs generally. But it speaks to the basic point: increased productivity has not gone hand in hand with the satisfaction of human needs. What holds together the facts about food/absolute poverty and the facts about wages/compensation is the story they tell about productivity and power. The burden sharing and shared sacrifice of the past thirty to forty years has been decidedly one-sided. Increased productivity has come at the price of belt-tightening by those who can least afford it. 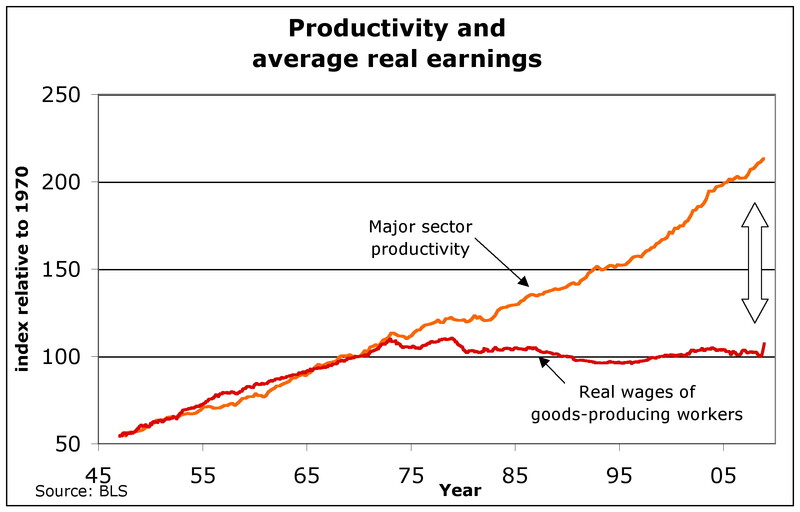 The real story of the past decades, then, is not increased productivity so much as the declining ability of workers and those in need to capture even a decent share of what is so efficiently produced. Perhaps a further lesson is that one should distrust a request for sacrifice today in the name of future gains. All that seems to translate into is a long-run weakening of a worker’s ability to lay claim to what he or she produces.